South Korean President Moon Jae-in has landed in Pyongyang for the historic summit with Kim Jong-un as part of the ongoing reconciliation process and talks on denuclearization of the peninsula. President Moon and his wife Kim Jung-sook were welcomed by the North Korean leader and Kim’s sister Yo-jong, as well as hundreds of locals. Their three-day trip to Pyongyang began on Tuesday morning. 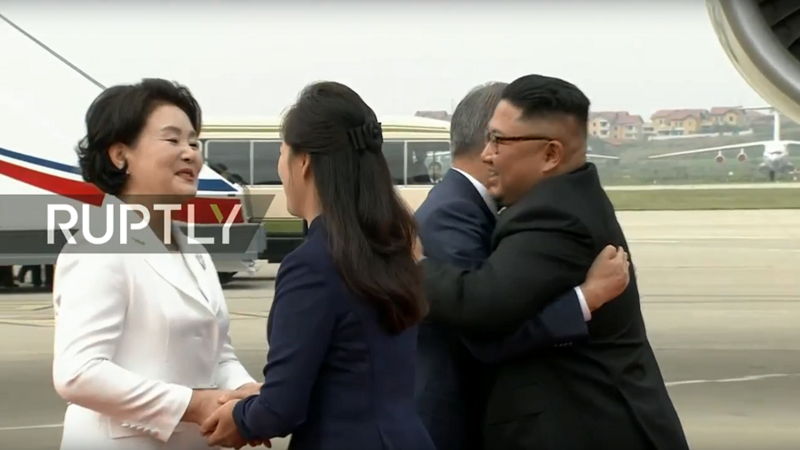 After Moon descended off the plane, Kim was seen offering a warm embrace to his South Korean counterpart, who worked ardently to bring about a thaw in bilateral relations between the two states. The South Korean president brought a large entourage of some 110 delegates, including top business leaders, that will discuss strengthening ties between the neighbors. Prior to Moon’s landing, some 90 South Korean officials arrived in Pyongyang on Sunday to participate in the historic summit.